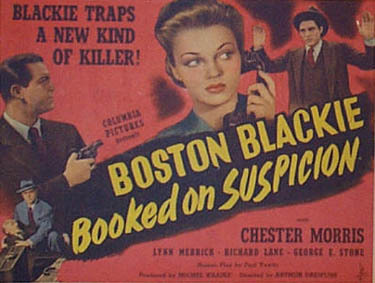 This is the eighth movie in the Boston Blackie series. Boston Blackie disguises himself as rare book expert, Wilfred Kittredge, and offers to conduct a book auction for his friend, Arthur Manleder, at his book store. Unknown to Blackie, the first edition of Charles Dickens' Pickwick Papers to be sold at the auction has been counterfeited by Porter Hadley. Blackie is aided by Kittredge's assistant, Gloria Mannard, on the day of the auction. The book is sold to Alexander Harmon for $62,000. The next day Harmon discovers that the book is a fake and reports the crime to Inspector Farraday. 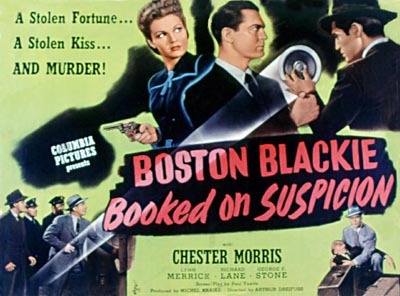 Farraday suspects Boston Blackie of the forgery. 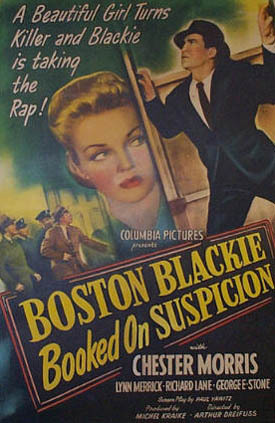 Blackie, still masquerading as Kittredge, is determined to prove his innocence and finds an address written on a sheet of paper in which the book was wrapped. Proceeding to the address, Blackie learns from the landlady that the forger, Hadley, has moved to the Jones Wrecking Company. Meanwhile Gloria, who is Hadley's partner, arrives at the Jones Wrecking Company, and demands her share of the money from Hadley. Then she shoots him. Blackie, drawn by the gunshots, hurries in to find Hadley's body and a envelope filled with money that Gloria left behind in her haste to escape. Farraday and Sergeant Matthews arrive and arrest him for murder. When a group of reporters converge upon the crime scene, Blackie manages to escape. Gloria, meanwhile, returns home to find her escaped convict husband, Jack Higgins, and schemes to retrieve the envelope. Blackie, still disguised as Kittredge, shows Gloria the money and then hides it inside a book, which he locks in a safe. That night, Gloria and Jack return to the shop to rob the safe but are frightened away by the arrival of Blackie and Manleder. From this point on Blackie has to dodge Farraday, try to keep Jack and Gloria from getting the money, capture Jack and get a confession from Gloria. Go Blackie, go. When an illness confines rare book expert Wilfred Kittredge to his bed on the eve of a rare book auction, Boston Blackie disguises himself as Kittredge and offers to conduct the auction for his friend and book store owner Arthur Manleder. Unknown to Blackie, counterfeiter Porter Hadley has manufactured a first edition of Charles Dickens' Pickwick Papers to be sold at the auction. On the day of the auction, Blackie, aided by Kittredge's assistant, Gloria Mannard, sells the book to Alexander Harmon for $62,000. The next day, Harmon discovers that the book is a fake and reports the crime to Inspector Farraday. 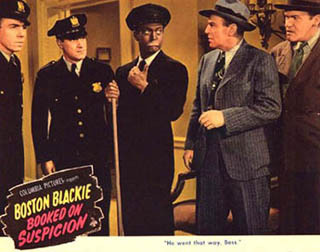 Farraday suspects his old nemesis Boston Blackie of the forgery, and when he is unable to find Blackie, he arrests Blackie's sidekick, The Runt, for questioning. Blackie, still masquerading as Kittredge, is determined to prove his innocence and finds an address written on a sheet of paper in which the book was wrapped. Proceeding to the address, Blackie learns from the landlady that the forger, Hadley, has moved. Noting the laundry number from a shirt that Hadley left behind, Blackie, posing as Inspector Farraday, goes to the laundry and finds out that Hadley is now residing at the Jones Wrecking Company. After Blackie leaves the shop, the owner becomes suspicious and phones Farraday. Meanwhile, Gloria, of the money from Hadley, shoots him. Blackie, drawn by the sound of gunshots, hurries into the building and finds Hadley's body and the envelope filled with money that Gloria left behind in her haste to escape. 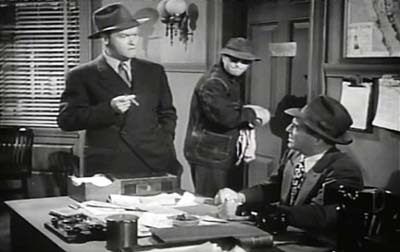 As Blackie examines the gun, Farraday and his assistant, Sergeant Matthews, arrive and arrest him for murder. When a group of reporters converge upon the crime scene, however, Blackie hides behind a photographer's camera and escapes. Gloria, meanwhile, returns home to her escaped convict husband, Jack Higgins, and schemes to retrieve the envelope. Hoping that Runt will lead the police to Blackie, Farraday releases him from custody. At the book store, Blackie, in the safe. That night, Gloria and Jack return to the shop to rob the safe but are frightened away by the arrival of Blackie and Manleder. Noticing that the shades have been drawn, Blackie tells Manleder to lock the money in his home safe while he plants an envelope filled with blank paper inside the office safe. The next day, when Blackie opens the office safe to remove some rare books, Gloria takes the envelope from inside the book. Upon discovering that it is filled with blank paper, Jack sends Blackie a blackmail note directing him to a meeting at a cafe. There, Jack, wearing a fake mustache and sunglasses, demands that Blackie return the money. Blackie recognizes Jack, however, and in hopes of trapping the killer, offers to split the money with him. Jack tells Blackie to deliver his share to an address outside of town, and as he prepares to leave, Blackie queries him about his wife. After Jack replies that he has married a "college dame," Blackie begins to suspect Gloria. When Runt appears at the bookstore and tells Gloria that the money is in Manleder's safe, she realizes that Blackie is double-crossing them and notifies Jack. Farraday, meanwhile, discovers that Kittredge has been bedridden for several days and deduces that Blackie has been masquerading as Kittredge. Before leaving for his appointment with Jack, Blackie sends Manleder a telegram, instructing him to send Farraday to the address of the meeting if Blackie has not phoned by the time Manleder receives his message. When Blackie arrives for his meeting, Jack greets him with a gun and orders his accomplice Diz to guard him while Jack steals the money from Manleder's safe. After Jack leaves, Blackie sings Diz to sleep and then escapes. Manleder, meanwhile, has notified the police, and Matthews' car passes Blackie on the road. Blackie drives to Manleder's apartment and is met by Gloria and her gun. Upon hearing the sound of approaching police sirens, Gloria sends Jack out the back door. Soon after, Farraday arrives to arrest Blackie, and Gloria pretends to be an innocent victim. Blackie escapes, however, and tells Manleder to stall Gloria while he and Runt drive to her apartment. Upon arriving at the apartment, Blackie locks Jack in the closet and then phones Farraday with the address. When Gloria returns, Blackie pretends to shoot Jack and threatens to shoot Gloria unless she writes a confession. After Jack regains consciousness, he pulls a gun on Blackie and Gloria burns her confession. Just then, Farraday bursts into the apartment and recognzing Jack as an escaped convict, arrests him. Blackie then tricks Gloria into admitting that she killed Hadley, and Farraday finally accepts Blackie's innocence.